It doesn't matter if gelatin salads are unfashionable or not; they're always delicious. 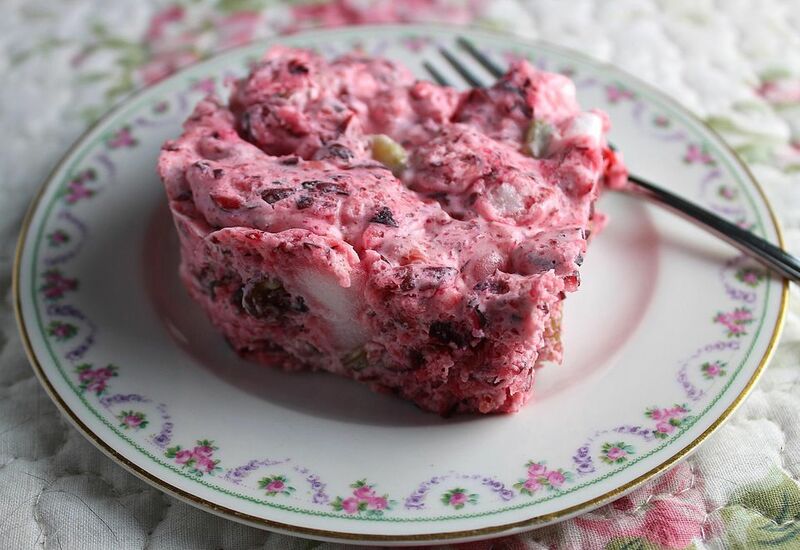 This recipe for Creamy Molded Cranberry Salad is a favorite salad for Christmas. The tart cranberries are combined with marshmallows and grapes and suspended in a creamy gelatin mixture. You'll love it, even if you don't like cranberries. For cranberry lovers, this salad is the ultimate. Follow the directions to the letter in this recipe. You have to soften unflavored gelatin in cold water first, then dissolve it in boiling water. To check if the gelatin is dissolved, pick up some of the liquid with a spoon and tilt it a bit. If you don't see any grains of gelatin, it's dissolved. This recipe is simply fabulous with ham and scalloped potatoes. The colors are so beautiful too, and perfect for Christmas. In a small bowl, combine the gelatin and cold water; let stand for 5 minutes. Add the boiling water and stir until the gelatin is completely dissolved. Place the bowl containing the gelatin mixture in the freezer for 15 minutes to cool. Then, in a large bowl, combine the ground cranberries, granulated sugar, and marshmallows; let stand for 20 to 30 minutes to let the sugar dissolve. Add the gelatin mixture and stir well with a spoon. Add the grapes. In a medium bowl, beat the heavy whipping cream with the vanilla and vanilla until stiff peaks form. Fold the whipped cream mixture into the cranberry mixture. Rinse a 2 1/2 quart ring mold with cold water; do not wipe dry. Add the salad mixture, cover, and chill until firm, about 4 to 6 hours. To unmold the salad, place the salad upside down on a serving plate. Rinse a clean kitchen towel in hot water and wring out thoroughly. Place the hot towel on the mold for a few seconds. Then hold the mold and plate together and shake gently. The salad should drop right out of the mold. But if you fear trying to unmold a gelatin salad, just put the mixture into a 2-quart baking dish. Then you can cut the salad into squares and serve it that way. It's just as pretty, and much easier to make and serve. Cover and chill again, or serve immediately.